Oracle flexfields is one of the most important parts of Oracle Applications. It is because of the flexfields that the Oracle Applications is so generic in nature and can be used to suit any industry or organization. A flexfield, as the name suggests, is a flexible data field that your organization can customize to your business needs without programming. A flexfield is a field made up of sub–fields, or segments. While flexfields do not require programming, they do allow you to perform significant customizations to the Oracle Applications, so they do require enough explanation for you to get the most out of the features they provide. Oracle Applications uses two types of flexfields, key flexfields and descriptive flexfields. A key flexfield is a field you can customize to enter multi–segment values such as part numbers, account numbers, and so on. A descriptive flexfield is a field you customize to enter additional information for which your Oracle Applications product has not already provided a field. · Have “intelligent fields”—fields comprised of one or more segments, where each segment has both a value and a meaning. · Rely upon your application to validate the values or the combination of values that you enter in intelligent fields. · Have the structure of an intelligent field change depending on data in your application. · Capture additional information if you so choose. · Customize data fields to your meet your business needs without programming. · Query intelligent fields for very specific information. Most organizations use “codes” made up of meaningful segments to identify general ledger accounts, part numbers, and other business entities. Each segment of the code can represent a characteristic of the entity. For example, consider an account number for a bank. A complete bank number may consists of various segments like the country code, area code, city code, branch code, account type, account number etc. For example, the number of segments a bank requires to identify an account number uniquely is a requirement specific to the bank. Another bank might not require a country code if its presence is there only in one country. Key flexfields are used to identify such information uniquely. A key flexfield is flexible enough to let you use any code scheme you want to describe an entity. When your organization initially installs an Oracle Applications product, your organization’s implementation team customizes all the key flexfields in that product to use meaningful code segments to describe each key flexfield entity. Your organization decides for each key flexfield, how many segments an entity has, what each segment means, what values each segment can have, and what each segment value means. Your organization can also define rules that govern what combination of segment values are valid (cross–validation rules), or define dependencies among the segments. The result is that your organization can use the codes it needs rather than change its codes to meet someone else’s requirements. The Accounting Flexfield in your Oracle Purchasing application is an example of a key flexfield that identifies a unique chart of accounts. One organization may choose to customize the Accounting Flexfield to have three segments called Company, Department, and Account, while another organization may choose to customize the flexfield to have five segments called Company, Cost Center, Account, Sub–Account, and Product. 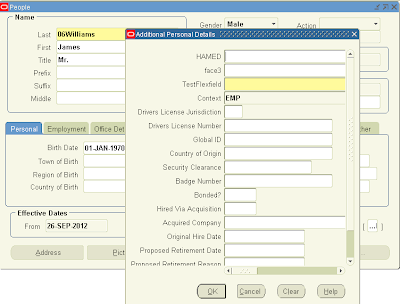 A key flexfield appears on your form as a normal text field with an appropriate prompt. 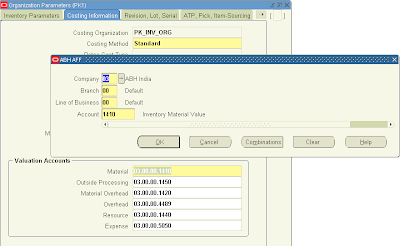 In figure 1 below, the Account field is actually the Accounting Key Flexfield. Descriptive flexfields like the key flexfields provides further scope of customization in Oracle Applications. 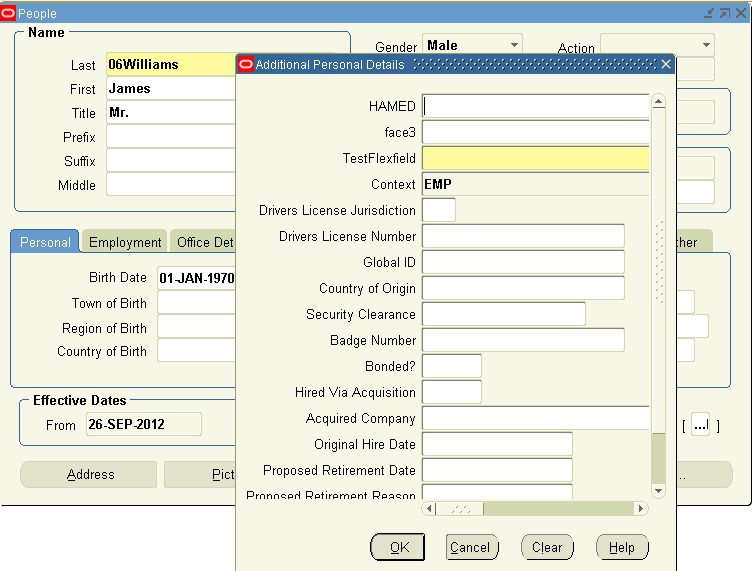 Descriptive flexfields provide customizable “expansion space” on your forms. Though the fields on an Oracle Applications form are more than enough to capture all the possible information from the user perspective, but still the users can feel the need of capturing additional information. A descriptive flexfield gives you room to expand your forms for capturing such additional information. A descriptive flexfield appears on a form as a single–character, unnamed field enclosed in brackets ([ ]) as shown in below.